There are three and a half Shakti Peeth in Maharashtra. But SaptaShrungaGarh is recognized as the original location of Shakti, since the God himself took the form of the Goddess and set down at this place, and therefore this is the real Goddess mother. The deity in the fort here has the honour of being a half Shakti Peeth of Goddess Shakti. The deity here is believed to be a form of the Goddesses Mahakali, Mahalakshmi, and MahaSaraswati. It is also believed that after vanquishing the demons ShumbhaNishumbha and Mahishasur, the Goddess resided here for Tapa and Sadhana . 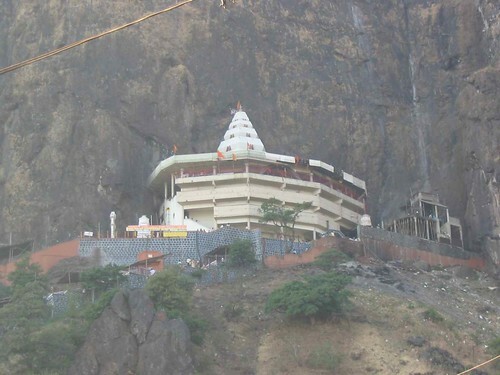 This holy place comes under Nashik District. Nashik Sahajyogis had organised many public program activities over here in past including Yuva Seminars too. Goddess RenukaMata of Mahur is one of the complete Jagrut Shakti Peeth of the Goddess. She is also recognized as the mother of Shri Parshuram. She is the tutelary Goddess of many families in Maharashtra. It is said that the temple here was built by Yadava king of Devgiri in the thirteenth century. The fort in Mahur here has other holy places along with the Goddess’s temple, like Parshuram temple, Dattatraya temple, Anasuya temple, KalikaMata temple etc. Devotees believe that the Lord Dattatreya was born here. The Fort RamGad is close to the Mahur fort, which has caves with carvings. Goddess TuljaBhavani of Tulajapur is one of the complete Jagrut Shakti Peeth of the Goddess. This deity is famous as Devi Bagvati (Bhavani). She is the tutelary Goddess of Maharashtra, being the inspirational, motivating deity who was revered by King Shivaji who established his kingdom. This village is located on a ridge of BalaGhat. Some part of the temple is built in the Hemadpanthi style of architecture. Historically, this temple is considered to be built either by Rashtrakut or the Yadava. Chhatrapati Shivaji used to take her blessings for success in his military campaigns. It is believed that the Tulja Bhavani presented Shivaji with the Bhavani sword. Shri MahaLakshmi of Kolhapur is one of the complete Jagrut Shakti Peeth of the Goddess. People pray goddess Ambabai (Mahalaxmi) for a peaceful & healthy life. Shri Mataji had visited this temple few times.